Warnars can now avoid serving the 19-year prison sentence that was awaiting him had he accepted a plea deal offered by prosecutors. State law precludes individuals convicted in juvenile court from being held in custody beyond their 23rd birthday. Trice’s ruling marks one of the first cases in SLO County that was swayed by the recent passage of Proposition 57, the early release for “non-violent” felons measure. Prop. 57 gives judges, rather than prosecutors, the power to decide whether or not to try minors as adults. Last July, a group of five teens showed up at a sleepover party held at a rural Templeton home where mostly Mission Prep students were gathered. The teens left the party and returned around 3 a.m. armed with guns and a baseball bat and wearing bandanas over their faces. When the alleged robbers returned, most of the partygoers were sleeping. The defendants allegedly fired shots into the air and forced the partygoers to go outside and lie on the grass. Some of the teens were in their pajamas at the time, and some had no shirts on. Two of the partygoers were reportedly beaten over the head with a bat. 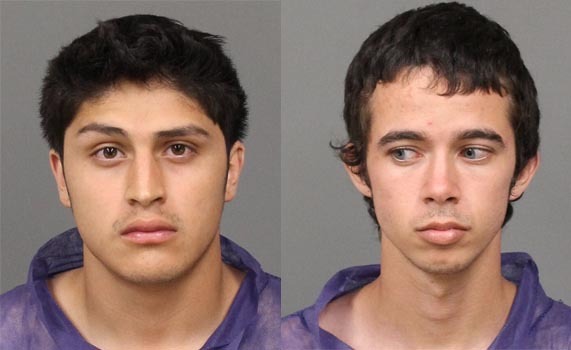 The alleged robbers reportedly turned on the sprinklers and terrorized the teens at the party for about an hour, before robbing them of wallets, phones and even a couple vehicles. Shortly following the robbery, sheriff’s deputies arrested Donovan James Alford, Albert Charles Heinicke Jr., Marshal Ryan Kaplan and Levi Cody Mattson, in addition to Warnars. Kaplan, Mattson and Warnars were all minors. Warnars, who was 16 at the time of the robbery, is charged with several felonies, including assault with a deadly weapon, residential burglary and home invasion robbery. If Warnars was convicted in adult court of all of his alleged crimes, he would face more than 100 years in prison. There is conflicting testimony as to whether Warnars fired a gun during the robbery. Warnars’ attorney, David Vogel, has said his client had a substance-abuse problem, as well as an auditory processing disorder. The robbery was a misguided attempt to steal alcohol that spun out of control, Vogel argued. For two days prior to Trice’s ruling, Warnar’s father, sister and girlfriend testified the teen was a good kid who had recently begun abusing alcohol and marijuana and getting into trouble at school. Vicki Angelini, an Eagle Canyon High School teacher, testified she taught Warnars at the Templeton continuation school for a year and a half ending in June. Angelini said Warnars fell into a downward spiral, failing to complete schoolwork and interrupting classes, at times with violent outbursts. Angelini said Warnars has an alter ego that sent her home many nights, lying in bed, worrying about him. The teacher said she has never had a more difficult student than Warnars. Nikita Brixey, Warnars’ former probation officer, said, prior to the robbery, the teen was on a six-month probation term for his third offense of driving without a license. While delivering his ruling, Trice said he did not believe Warnars was a leader in the robbery. Also, the teen’s academic and criminal history, as well as the lack of planning in the robbery, showed Warnars’ lack of sophistication, Trice said. Warnars’ hearings in juvenile court will begin in early February. Similar hearings over the potential transfer of Mattson and Kaplan’s cases to juvenile court are scheduled for next month. Trice will preside over those hearings, as well. Heinicke has accepted a plea deal of eight years in prison in exchange for testifying against his co-defendants. The district attorney’s office’s decision to offer Heinicke the chance to testify has been met with an angry reaction from several of the victims’ parents. Heinicke is accused of beating two teens over the head with a baseball bat during the robbery. What bothers me the most in cases like this is that in 6-7 years when they get out and immediately re-offend, and someones dead because of it, no one will remember the idiot judge who made this stupid decision. The cost of keeping human debris like this in prison is nothing compared to the what they cost society when they are free. disagree. Don’t believe they are career criminals. Second, have you wondered if in fact our ‘rehabilitation’ system does NOT work, that it is there as incarceration? Because it provides good paying HOH jobs? It’s a fact. We love to lock people up in this country and hope they get better. But we don’t do much to help them. Our criminal justice system is a colossal failure with regards to rehabilitation. Our 5-year recidivism rate is in the mid 70% range—the highest in the western world. Most western european countries are between 20%-40%. Fact of the matter is crime is really profitable for institutions that have grown to address the symptoms of the problems that are created, and the survival of these institutions is contingent upon people continuing to committing crimes. If you want to solve this mess you are either going to have to get money out of politics or enough people are going to have to get smart about what’s going on behind closed doors at the state and national level. One of my devices won’t allow a direct reply. I agree. He absolutely shouldn’t get a free release. I’d also agree that it was premeditated, and because he beat the kids with a baseball bat, it makes things even more difficult. I think you may agree that it is unfortunate that we must deal with such events and place our youth into prison, when we know full well they aren’t thinking straight, that their brains are not even formed yet. The reason for argument is simple: I want these youth rehabilitated. Not locked up for life. Well, as long as they used their firearms and baseball bat in a non-threatening manor and if they say they are sorry and won’t do it again, I see no problem at all. Oh that rascally kid. Just some teenage hijinks. Reminds me when my friends and I use to go and terrorize the neighborhood. What is wrong with society? Don’t people know all these kids need safe places and no consequences. This will help in making them better people. I think the five years proposed that he might serve is even to much. Can’t we just give him a participation award for being at the crime? You’re nuts if you think that kid does not deserve some “time out” time! Let me guess – ‘snowflake’. And you’d prefer to pay for 20 years in prison, not to mention that after that long incarcerated, the chance of him doing anything else is almost zero. Nobody ever said ‘no consequences, except you. Now answer my question. You wanna pay 20 years of prison so you can see this guy become nothing, for some foolish, idiotic mistake he made at 16? What I’d like to see is NOT the automatic get out of jail free. Remember the kid that beat the old man with the skateboard? Remember he was going to be released a couple years ago because…………he was at the limit of juvenile detention at 25? Remember how he was reformed and kept saying he wanted to kill the Governor? So let me ask YOU a question. Do you just want someone to automatically get out after a short time because they timed out? How about some common sense and instead give him a sentence of say 15 years AND he can have a parole type of hearing at which point he times out of juvenile detention. Then we can decide to either release or move to adult jail. Wouldn’t that be the more common sense thing to do???? Oh and foolish mistake? Ditching school is foolish. Drinking is foolish. Pot smoking foolish. Committing THREE felonies is not some mistake. It took not one, not two but THREE!! They beat two other YOUNG people on the frigging head!!! How about if that was your kid that got beat? Would you still think, oh golly gee whez kids will be kids?